HEY! WHO'S STEERING THE BOAT? Annoying writer habits – Those irritating idiosyncrasies that are immediately recognizable in OTHER writers. 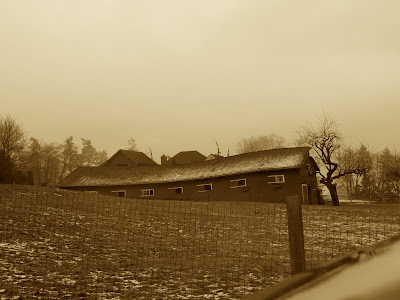 My resource for this blog post is Tooloose the soon-to-be-famous aspiring writer. Notice I’ve said “aspiring writer”. Tooloose has not actually successfully WRITTEN anything (that pesky absence of the opposable thumb). He is an “aspiring” writer, which is the level just under the “aspiring” author. 1. Discussing writing, debating literary strategies, outlining the premise of the sure to be BIG BOOK but never actually putting anything down on paper. For example: Tooloose’s opus KILLER ALIEN SPACE MONKEYS DON’T GIVE WATER TO ELEPHANTS. You notice that Tooloose has incorporated the first rule of writerly wisdom making his title similar to a successful best selling novel. He has also changed his pen name to Tooloose Gruen: Sara’s furry sibling. He is working on getting a blurb from her. I suggested he might want to write the book, first but he is adamant on his networking strategy. Of course this applies not just to writers but other artists as well. The year was um er 1959? 1960? 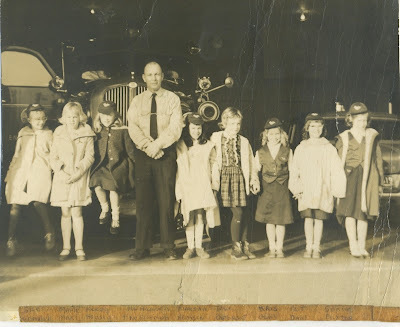 I do know it was Mr. Hanson the fireman and it was a HUGE deal to have a tour of the fire station. I remember I was acutely disappointed there was no dog. Nada. None. And I wanted to ride in the fire truck. I felt sure that would be part of the deal. But we did get graham crackers and some sort of juice. And we did get the picture. I have moved from place to place but this is a memento I've never lost. So the contest is on. This is one of the photos I'm using for inspiration for my next novel. I changed it to sepia and kind of like the affect. I'm lucky I don't write SF. Imagine how hard it would be to get pictures of space ships engaged in battle or farms on Mars...or those twenty tentacled alien lobster monsters. I often wonder how Tooloose does it as I think that's his genre. Well he doesn't call it SF. He prefers to think he's writing a pararomantiliterarlmystericalthriller. I think he's doing it so he gets his very own shelf in the book store. He SAYS he's ahead of his time and is a ground breaking artiste. Of course it's all a moot point until he actually FINISHES it. I tell him he's got to WRITE to do that and he just rolls his eyes. I used to live just outside of Washington DC in Alexandria Virginia while I was stationed at Ft. Belvoir. This was in the turbulent '70's. I remember the monuments, the Smithsonian and the mall. I am there today in spirit. This is a great day to be an American and from Hawaii. There are some things in this world you just have to think about. My family and me are admirers of You. I beg Your pardon, but I have a request to make. I am one people who wishes the picture with Your autograph. Now I have this other fan in India who keeps making the same request. I had no idea I was that popular. Of course I thought I was the only one...but when I googled these guys I found out they ask everyone for a signed photo. I feel bummed. I thought it was just me. This one entitled "The author and friend." And I'm REALLY enjoying this one! You guys might want to run out and buy it...right now. Go. My reading tastes are eclectic. From Kafka to Rowling. From Monk-Kidd to Merwin. From Simenon to Allingham. I need a way to set my imagination free. Let it run wild. Reading Cchildren's books helps me do that. I even re read classics from when I was small. When I finish with a draft and send it on to my agent I have to let that story go so I can come back to it fresh. See it with new eyes. So I figure out ways to start generating new ideas. I'll even take breaks by line editing my other manuscripts. Something. Anything to keep me going. New ideas. When you get them immediately write them down because if you don't, you lose them. Trust me. 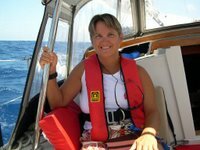 My new idea is a story about sailing. About a man looking for a second chance. And a boat. It started with a giant "What if?" I have other ideas but this one grabbed me. If you're wondering? You don't take hold of the ideas, they take hold of you. And inbetween reading and writing and editing? I do book clubs for LOTTERY on speaker phone and SKYPE. So I interviewed TOOLOOSE and asked him where he got his ideas. thuts a ned 2 no basus. But I suspect that he steals them from Girl Kitty. I saw him taking notes. FOR THOSE OF YOU WHO THOUGHT I'D NEVER SEEN SNOW BEFORE...I did last year at HOLLY'S HOUSE. I admit it. I'm afraid of the cold. It's even hard for me to open the refrigerator. I use a down comforter in Hawaii at night. Any way I got to thinking what everyone's afraid of. After reading some of my writers' message boards I realized people are still afraid others are going to steal their manuscripts. "Britain's former prime minister is holed up in a remote, ocean-front house in America, struggling to finish his memoirs, when his long-term assistant drowns. A professional ghostwriter is sent out to rescue the project - a man more used to working with fading rock stars and minor celebrities than ex-world leaders. 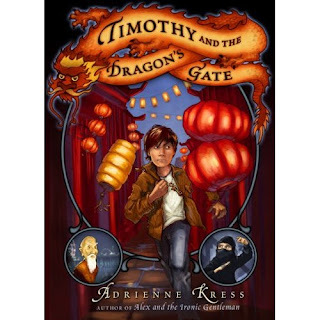 The ghost soon discovers that his distinguished new client has secrets in his past that are returning to haunt him - secrets with the power to kill. Robert Harris is once again at his gripping best with the most controversial new thriller of the decade." Okay maybe not Paris Hilton...but the other stuff is true. Tooloose is over the moon. He got his very own Tiny Tooloose for Christmas so it's really quite impossible for him to work on his manuscript. He's busy carrying T.T. around. Grooming him. Trying to get him to eat (he's quite finicky). But the UK edition of LOTTERY is out now! YIPPEE SKIPPEE! And it's been chosen as the TESCO BOOK CLUB SELECTION for January 09!!! 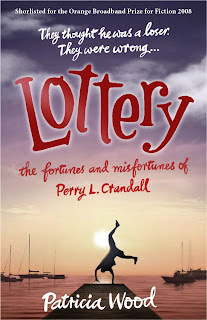 The paperback of LOTTERY: The fortunes and misfortunes of Perry L. Crandall was released in the UK on January 1, 2009.